When you think of custom cut glass, you likely envision sparking tabletops with beautiful, beveled edges in the lobbies of banks or hotels. These pieces of custom cut glass may appear out of reach for your home or business, but they’re not! At Lancaster Paint & Glass, we specialize in creating beautiful, unique shapes for our customers’ unique needs. In custom cut glass, the shape of the glass piece is the first hurdle. Whether you’re looking for a custom tabletop or filling a unique window frame, Lancaster Paint & Glass can cut the shape you need. We can even design custom shapes to fit your exact specifications! Obviously, different custom glass projects require different glass thicknesses. 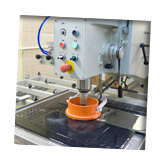 Fortunately, Lancaster Paint & Glass is capable of designing glass tabletops in different thicknesses. No matter the glass project, we can create a piece to fit your needs! There are many different edge styles that can be used to create unique custom glass pieces. We offer six standard edges, but you can also design a custom edge to make your piece stand out against the rest. Corner details in custom cut glass can improve the look of a custom project almost immediately. These corners can be cut to any pattern, and can enhance the finished look of the surface. Many people choose to use corner details on mirrors or tabletops, as they add a more elegant feel to the glass. In the modern world of cookie-cutter goods, we have come to expect flawless perfection in everything we buy. However, glass is a natural material which contains natural flaws that may be visible to the naked eye. These flaws are unavoidable; even the finest raw materials contain them. The federal government has established specifications, however, that no defects should be visible in the glass when it is viewed horizontally or vertically from 11 feet away under normal lighting.